The BayArena is a football stadium in North Rhine-Westphalia, home to Bundesliga club Bayer Leverkusen. Recently renovated in 2009 at a cost of €70 million, the ground has a league match capacity of 30,210 and is in the process of becoming a 5-star UEFA stadium. The BayArena is the home of Bayern Leverkusen and the stadium today from the outside bears little to no resemblance to the original ground which opened on the 2nd of August 1958. Known then as Ulrich-Haberland-Stadion, Leverkusen’s first version of the BayArena had a capacity of 22,500 before being expanded to 27,000 in 1986. Numerous additions were made to the ground in the 1990s as well including a hotel, a new scoreboard and VIP seating. Both the East and West stands were reconstructed which resulted in a fully-enclosed stadium. Essentially becoming a pure footballing Arena, the ground’s name was changed to BayArena in 1997 to reflect this new direction. The gamble paid off and by the mid 2000s the club began to grow and even reached the Champions League final in 2001 – 2002 season before falling slightly short against Real Madrid. An increase in the club’s revenue was reinvested in the stadium in 2008 as part of a Modernisation program and it was this stadium redevelopment that gives the BayArena it’s iconic structure and design as we see it today. 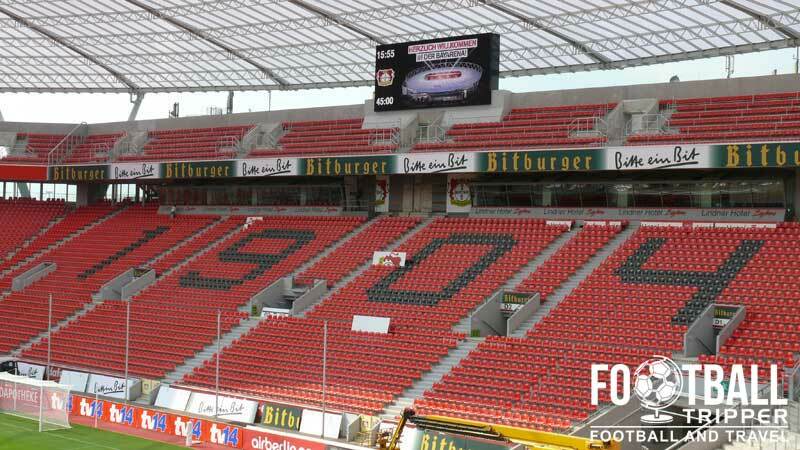 The capacity includes 2,500 terrace spots and the colour of the seats was changed from green to red, reflecting Bayern Leverkusen’s traditional colours. The 70 million euro redevelopment also saw the addition of a large cylindrical roof, and the first Bundesliga Match was held on the 15th August 2009 against 1899 Hoffenheim, with the German national team taking on South Africa in a friendly a a month later to mark the stadiums redevelopment. For now the stadium is complete but Bayer 04 Leverkusen are always exploring new ways to enhance the match day experience. In April 2013 they announced plans to create a Multimedia experience with the installation of over 500 HD monitors and 350 wireless internet access points throughout the stands, as well as an interactive app which has exclusive content, games and player ratings for fans during the match. BayArena is comprised of four sections which correspond to points on the compass: Nordbereich, Ostbereich, Sudbereich and Westbereich. 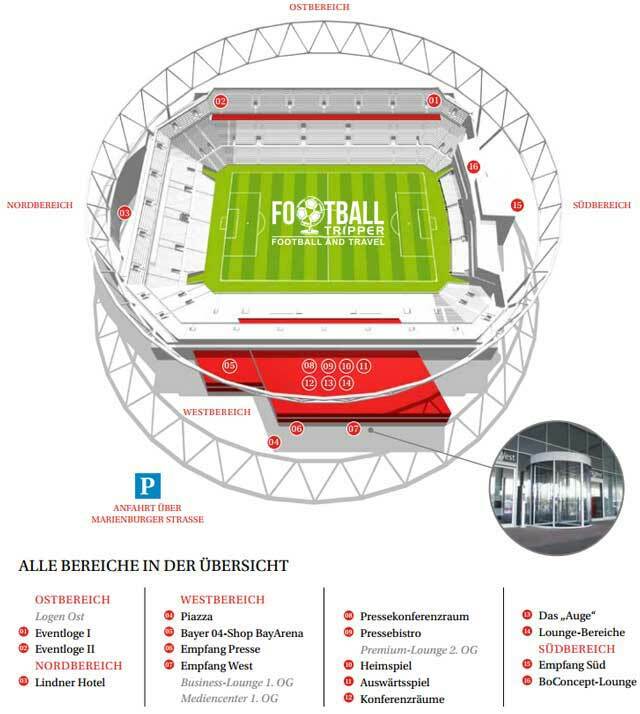 Away fans who make the trip to BayArena are housed within the south-west corner between the south stand which contains a lot of the executive boxes and western section which is regarded as the main stand. 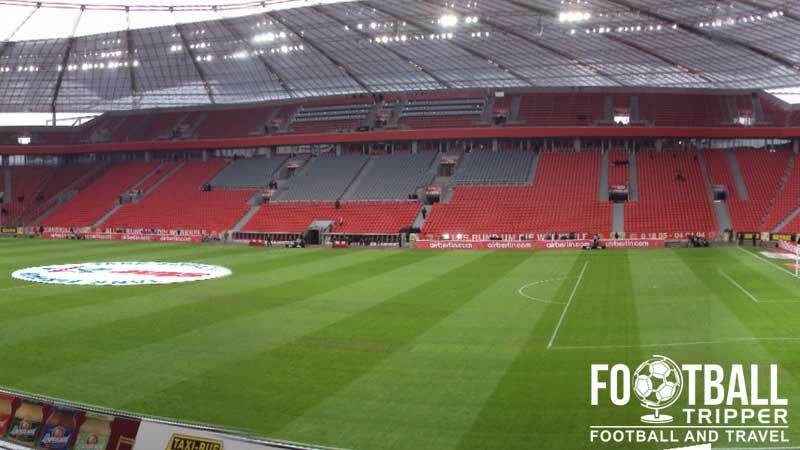 Capable of seating around 2,500 travelling supporters, the area is fenced off from the home section and is essentially located opposite the Leverkusen Ultras in the north stand in order to create a better atmosphere throughout the stadium. The fact that the area feels relatively compact when full helps also helps create a sense of camaraderie amongst the travelling faithful. Spanning across two-tiers with the lower section being much larger, occasionally away fans are permitted to sit in the adjacent block if the demand requires it and the away allocation needs to be increased. One of the smallest city’s in the Rhine Region with a population of around 161,000, Leverkusen hasn’t got the most diverse range of watering holes but thanks to its working-class traditions there are a good number of traditional pubs around the city. The map below outlines a few but to be honest most fans prefer to drink at the stadium itself. BayArena is famously the first stadium in Europe to have a McDonalds restaurant at the ground, and predictably it usually does a roaring trade on matchdays. There’s also the Pille Sportbar which has a fair selection of food, but most of the options are to be found in the concourses. Run by Bayer Gastronomie, fans can purchase the usual fast-food options such as fries, pretzels and hot dogs although this must be done so using the cashless card system. The opening times for the “Leverkusen City” shop are listed below. The Bayer 04-Shop on a matchday, complete with shooting challenge. Looks like even the average German on the street has better shooting accuracy than the England team! 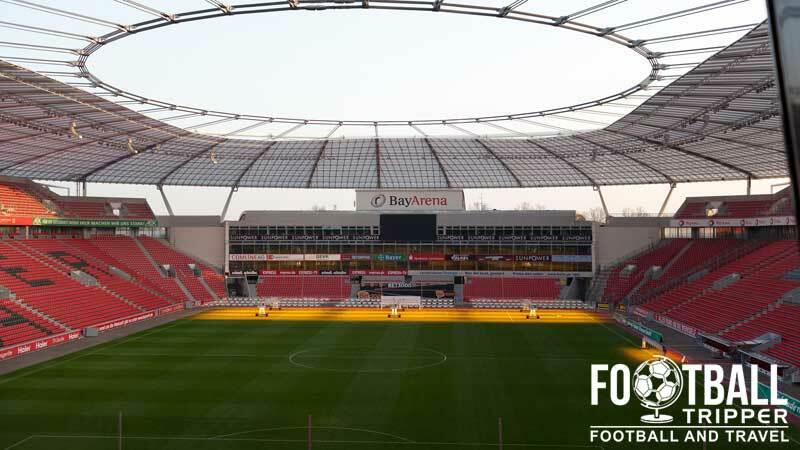 Bayer 04 offer fully guided stadium tours of their home ground, BayArena, for the bargain price of just €9.00 for adults. Taking in such sights as the players’ changing room, the manager’s dugout, the press room, the tunnel and VIP areas, tours start at either 11:00 am or 3:00 pm once or twice a week. Tours depart from the entrance to Viini which is on the east side of BayArena across from McDonalds. To book your tour or to find out more information you can either phone +49 (0) 1805 040404, send an email to [email protected] or visit this page. 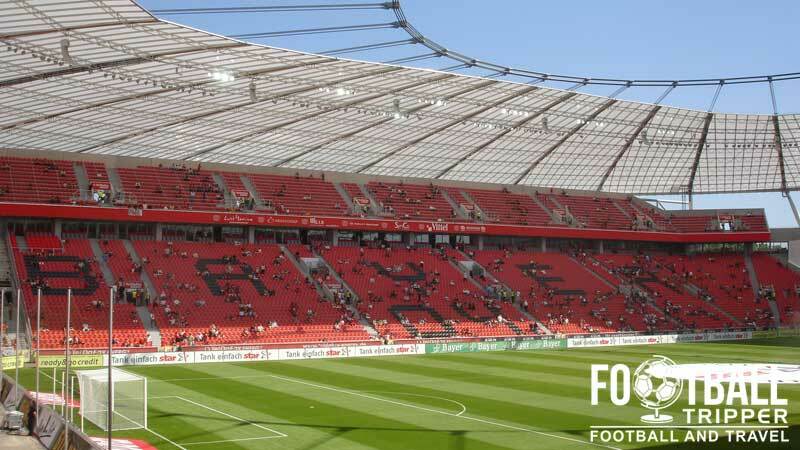 Tickets to see Bayer 04 Leverkusen at the BayArena can either be purchased online, via phone (+49 (0) 1805 040404), or at one of the two listed Bayer 04 shops listed above. The lowest profile matches (Category C) starting at €10.00 for a place on the terrace, €12.00 for an high up seat behind the goal and around €26.00 for something central within the main stand. Category A for the highest profile matches against the likes of Bayern Munich and Borussia Dortmund start at €18.00 for standing, and anywhere between €36.00 to €76.00 for seats behind the goal and in the main stand. Leverkusen is a city in North Rhine-Westphalia, located in the West of Germany near to the Borders of Belguim and Netherlands. BayArena is located out of town within an area known as Stadtpark. The exterior of BayArena is certainly unique in appearance. The extended roof coverage creates a pleasant area outside the ground where fans can conregate and have a beer before kick-off. BayArena is conveniently located nearby to where the A1 and A3 stretch of motorways intersect, although A1 does not have an exit specifically for the stadium which makes the latter the better choice. Located out of town there are numerous car-parks around the stadium which can be used on matchdays, most of which are free. One such example is “Kurtekotten”. Leverkusen Mitte Station (Bahnhof Leverkusen Mitte) is the main railway station of the city and it is located on the railway line between Cologne and Duisburg on the NRW-Express with the former city accessible within a short 15 minutes journey. BayArena is around 10 minutes walk away from Leverkusen Mitte Station with the S-Bahn line 6 connecting other parts of the city such as Leverkusen-Rhine village, Leverkusen-Küppersteg, and Leverkusen Chempark to this central most location. Once you have got off at the stop, it’s a short stroll through the Stadtpark to the Arena. The closest International flight hub to Leverkusen is Cologne Bonn-Airport which is around 26km South of the city. As the seventh largest passenger airport in Germany serving over 9.3 million passengers in 2012 alone, the airport is well connected to the rest of Europe, which makes seeing Bayer Leverkusen play football a very easy proposition. Once you have landed you can travel to Leverkusen in 15 minutes via the S-Bahn train line which was mentioned in the “Train section” above. The nearest hotel to the BayArena is the 200 room Linder Hotel which is on the site of the stadium next to the McDonalds which was built at around a similar time. We’ve bemoaned the lack of traditional city centre in Leverkusen already in this guide so I won’t go back into it in more detail but what I will say is that it doesn’t make recommending an area to stay very easy. As all I can give you is names of Hotels, I recommend Hotel Fück or Best Western Leoso Hotel Leverkusen.